The Sierra Nevada is the main source of in-state water for California, but over half of the precipitation in the Sierra Nevada is returned to the atmosphere by evapotranspiration (ET). Fires play an important role in regulating forest density, vegetation water use, and runoff. We analyzed evapotranspiration changes in response to fires in the Sierra Nevada between 1985 and 2015. We found that the most dramatic ET reduction (up to 3600 million cubic meters/year over the Sierra Nevada) occurred in the 1st year post-fire. Spatially, ET reduction varied from 95 mm to 238 mm per unit area burned in low to high severity fires. Forest stands that were originally greener and denser experienced a greater ET reduction. The combination of Landsat derived fire severity index and vegetation index can predict more than 80% of the spatial variations in ET reduction due to fires. This study demonstrates the potential for increasing runoff after fires in mixed conifer forests of the Sierra Nevada, California. 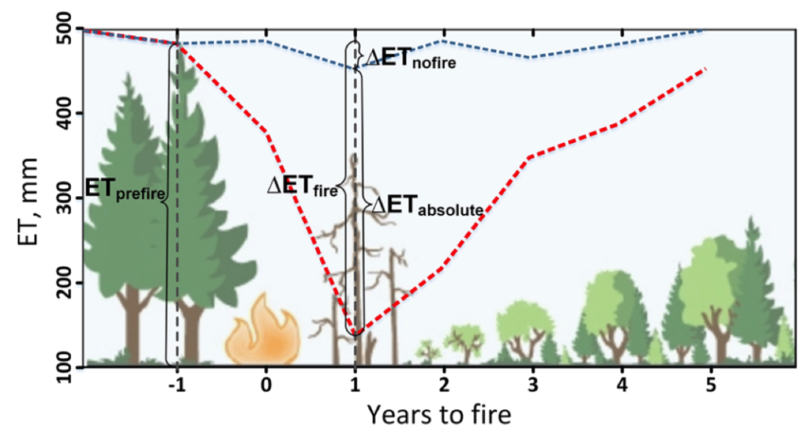 Spatially and temporally explicit data on vegetation water use and its change after fires provides a way to identify priority areas that are suitable for prescribed fires (set to increase water yields). In a warming climate, more forest restoration efforts will be needed including forest thinning, prescribed fires or managed wildfires, in the Sierra Nevada forests to reduce vulnerability to droughts and devastating fires. The Landsat derived Normalized Difference Vegetation Index is one of the most important inputs in scaling evapotranspiration from available point measurements. Without Landsat, we cannot scale vegetation water use at such a fine-resolution (30 m) and long-term scale (1985-2015). In addition, we used the fire severity maps derived from Landsat data to analyze fire impacts on vegetation water use. The consistently high quality of fire and vegetation indices from Landsat enable multi-decadal fine-resolution regional studies. Will your research results be shared with the government entities that manage prescribed fires in California’s Sierra Nevada? Yes, we always share our results and are working with public land managers in California. The ultimate goal of this study is to build a stronger scientific foundation for forest management by providing useful information to government and other entities that are managing forests, water resources, and prescribed fires. Reduction in ET post-fire across the Sierra Nevada for six fire severity classes. Greener and denser forests burned at higher severity, with greater drops in evapotranspiration. 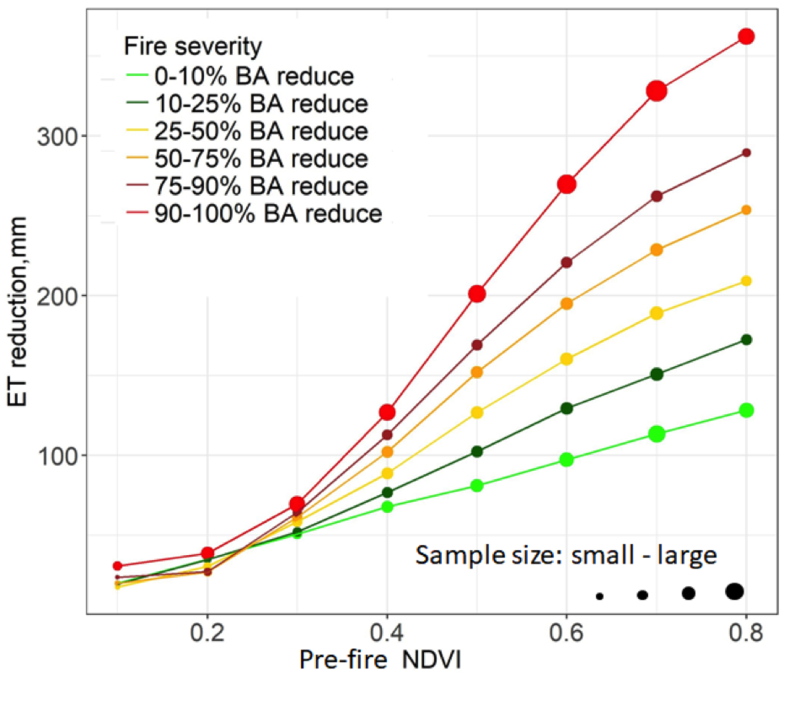 Evapotranspiration reduction presented on this graph by the mean values for each 0.1 unit pre-fire NDVI. Fire severity classes were determined by percentage of basal area (BA) reduced in the fires. Symbol sizes indicate relative areas in each class. This research was supported by the National Science Foundation through the Southern Sierra Critical Zone Observatory. This entry is filed under Carbon and Climate, Disasters, Forest Management, News, Q&A.